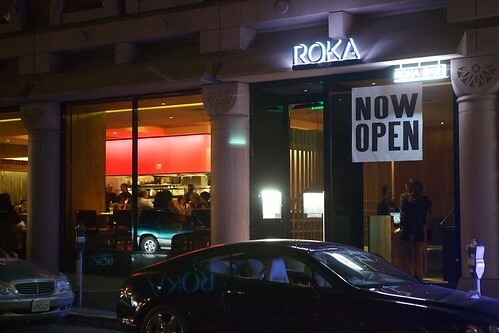 With successful locations in Arizona, Scottsdale, and London, it's about darn time San Francisco gets a Roka to call our own. And we beat New York, huzzah! Daniel Hyatt of Alembic fame set up the bar program, and his meticulous attention to detail is apparent from the decor to drinks. The upstairs is a fancy dining room, but we're not concerned with that. We were looking for some cocktails, so we went straight downstairs to the bar. 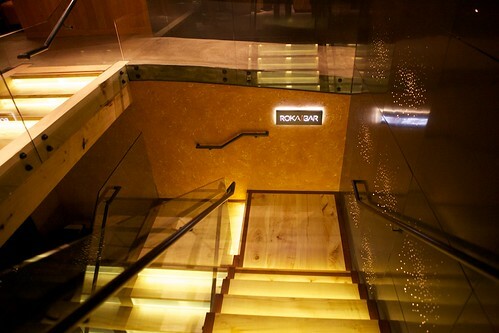 Daniel Hyatt describes the downstairs as "rock and roll" compared to the upstairs. The atmosphere is cool, casual, and upbeat. 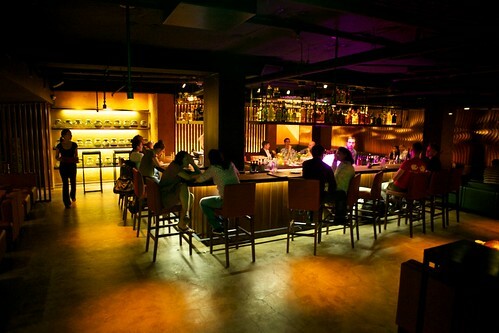 Although the restaurant closes earlier, the bar stays open till 2 in the morning. There's also a huge chunk of ice illuminated by every-changing colored lights. It makes you (and these pictures) feel like you're in the last twenty minutes of 2001: A Space Odyssey. 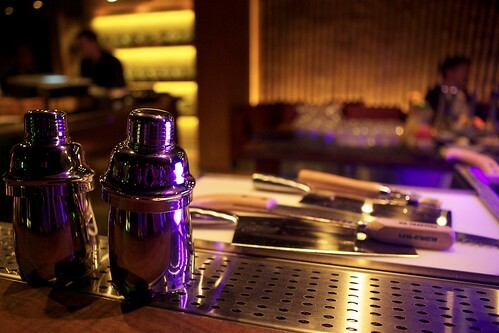 The Japanese theme pervades the bar, not just the restaurant. These Japanese shakers get lots of use with this menu. Hyatt took a culinary approach to the cocktails specifically so that they "play well with others." The drinks have a delicate balance of flavors that won't overwhelm the palate, but they're each interesting enough to enjoy on their own. People "take [drinking] for granted," Hyatt says, but it's more complicated than "just pouring booze in a glass." A lot of thought goes into all aspect of his program, and that's readily apparent.Take, for example, the Johnny Appleseed. 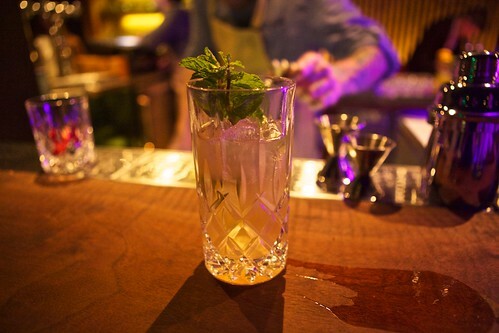 Johnny Appleseed: Lairds Applejack, barely tea simple syrup with chervil, lemon, mint. The barley tea simple syrup is more delicate than a traditional syrup, so the drink is lighter and more refreshing than most collins-style drinks you'll have. 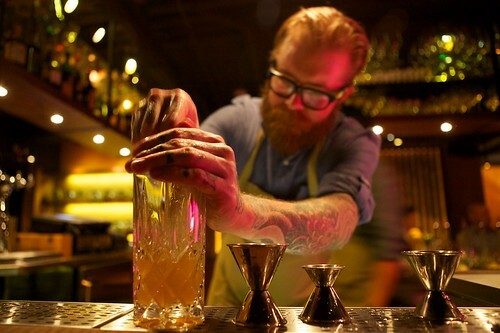 Not only is the drink well thought out, but also the glassware is specifically chosen to heighten your experience. Hyatt believes that "glassware sets a tone. 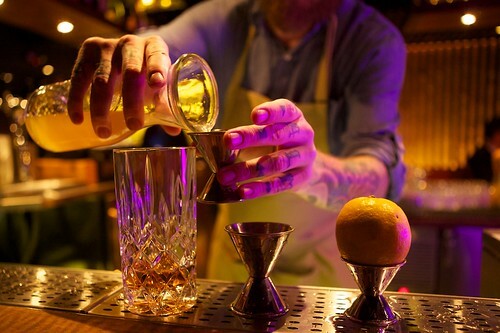 How you approach a cocktail is almost as important as what's in it. 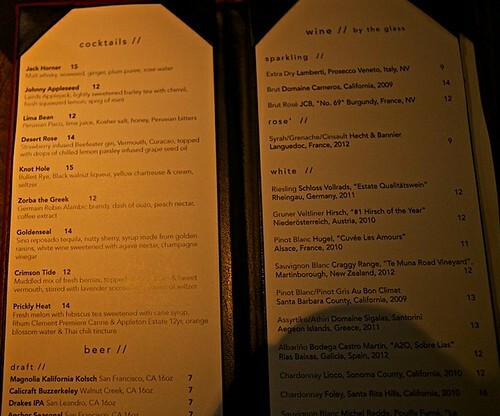 [Glassware] reminds you that you're drinking a cocktail, it's not a glass of water, it's not a shot." For Hyatt, a special glass is a way to "make someone feel special. You choose to come here. I'm going to appreciate you." 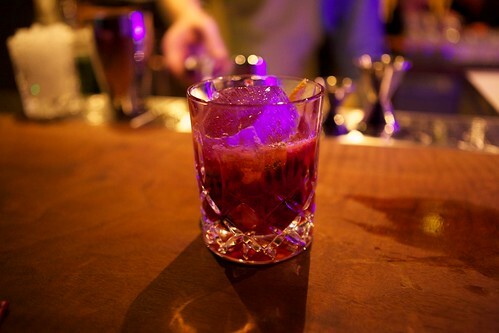 Crimson Tide: berries, Campari, sweet vermouth, and lavender scented ice; topped with soda water. This drink was a huge hit with everyone who tried it. The berries are sweet and delicious, and the Campari adds to that, but the drink finishes dry. Lima Bean: Picso, lime, salt, honey, Peruvian bitters. 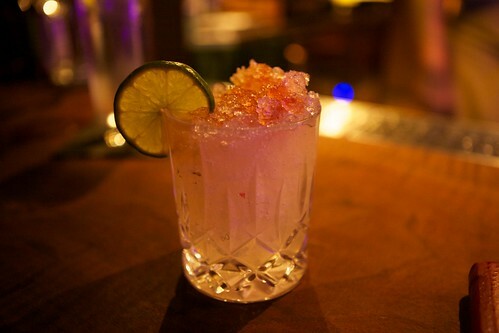 A very simple drink that will stimulate your appetite (thanks to the salt and lime). 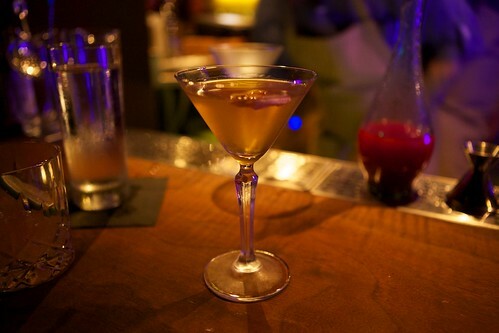 Goldenseal: Tequila, sherry, golden raisin syrup, white wine & agave nectar, champagne vinegar. This one is a bit more on the substantial side. The sherry and raisin give this drink a bit of a candy cap mushroom quality, while the rest of the ingredients make it a complex cocktail with lots of layers of flavors to work through. 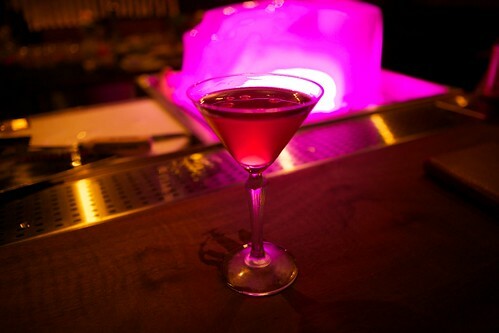 Jack Horner: Malt whisky, seaweed, plum puree, rose water. I was nervous that the seaweed would overpower this drink, buy Hyatt struck the perfect balance with this one. The seaweed is just present enough to tie the cocktail together, but honestly, I wouldn't have noticed the seaweed if it weren't listed on the menu. 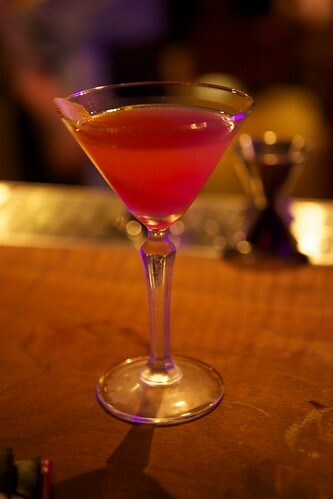 Desert Rose: Strawberry infused Beefeater, vermouth, Curacao. Garnished with grape seed oil infused with lemon parsley. Again, I misjudged this drink. I thought the garnish was a gimmick, but it really does add a unique layer of flavor to the drink. Now's the time to get this one, too, since strawberry season won't last forever. Once the berries are out of season, this drink will be off the menu.